A city which can be dubbed as Kevin Lynch’s Delight and Ian McHarg’s Disappointment. Well that’s what Panjim or Panaji, the capital city of Goa seemed to me. The capital city of Adil Shah’s mighty state, a jewel in the erstwhile Portuguese Crown, the Indian answer to the famed French Riviera: city of Cannes …Panjim has been the hot favorite since its inception. Tucked away on the gently sloping southern bank of the estuarine mouth of the magnificent river Mandovi, this city has its colonial flavor still intact. The tree covered Althino Hill, the colorful streets of Fountainhas, the Miramar Beach, the famed and well maintained Riverside Corniche all add up to the beauty of the city. Once a sleepy sea side fishing village replete with natural springs and coconut gardenlands interspersed by mangrove swamps, Panjim has come a long way. But the transition from its pristine estuarine bank to the present urbanized human settlement is not a smooth one. It can be seen as a perfect demonstration of the four staged “Man-Nature Relationship” . The first stage of ‘I-Thou’ was when Panjim was still a natural hillside sloping down northwards to meet the southern banks of the majestic Mandovi, the river free to flood the low lying portions of the Ourem and Marshy Lands. The second stage of ‘sustainable co-existence’ was when the fishermen built a non-descript hamlet and using the sources of the freshwater streams, started farming and made salt pans on the marshes. The third stage of “I-it” was initiated with the construction of Adil Shah’s Fort and Palace. This was followed by the construction of a causeway "Pointe de Linhares" linking Panjim with the historic Ribandar village by the then Viceroy, Count de Linhares, Dom Miguel de Noronha in 1632. The massive destruction of Old Goa by plague and other sanitary related conditions led to the idea of structuring Panjim as the new capital for Goa. Its well drained topography, its “naturally-protected-on-all-sides” location and its proximity to the sea which ensures tidal flushing thus cleaning up the water aided this decision. The Portuguese slowly started the process of reclamation of land, rampant construction of government buildings, and a magnificent riverfront. Over time the city has undergone many a change and today lies in the crossroads of 'development gone wrong' with scant regard for ecological processes. The old quarter of the city is thankfully well preserved and echoes its rich cultural past. But the more recent developments around the Panjim, many initiated by the unmindful bureaucratic aspirations leave much to be desired. “Patto Plaza-The Central Business District of Panjim” proudly published around in government publications as the new face of Goa is one such example. It is nothing but an ugly demonic concrete jungle with no reference to the strongly vernacular architecture neither in terms of style nor in scale, mushrooming out of the ecologically sensitive patto marshes. The rampant construction on the Bambolim Plateau with absolute disregard to the sensitive natural processes is also a matter of grave concern. The eying of the saltpan lands with luxuriant mangroves by the ‘Building Mafia’ and ‘Political Eagles’ is also a constant threat looming over the sound future of the city. 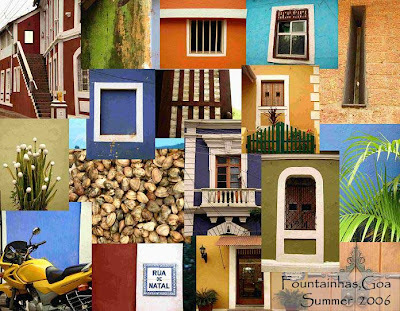 But it is not all that bad for Panjim, the still intact and well preserved precincts of Fountainhas and Campal are indeed encouraging enough to believe that a better future for Panjim is possible. The fact that Panjim is only the administrative capital of Goa and not a commercial capital, neither does it have a railway station nor is it the main sea port are all factors that will aid the city in slowing down the ‘urban decay’ which is a bane for most Indian cities. It is time we moved ahead to the fourth and final phase of the ‘Man-Nature Interaction’ i.e. the realization that ‘Nature has to be cared for and nourished for the well being of Mankind’. The global awakening to protect nature has already dawned, and it is time for Panjim to become both Lynch’s and McHarg’s Delight. inspiring! u come here! this place is for u! NICE PICS. I LIKE THE LAST PIC OF THE JODHPUR BLOG AND THE SECOND OF THE CLOUD ONE. ( not necessarily in tht order). light is very good. Wish I could do something for that city.It is such a unique,beautiful place. Great to see you on my blog...welcome back to blogosphere. Thanks for the comment.Keep visiting for more pics. 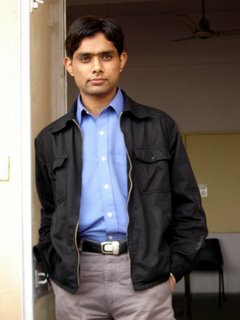 Hi Sohail...Thanks.Hey, i really miss your cartoons...please revive your blog. Hi siddhartha, am really surprised to see you here.Thanks for the compliment.